Nosler, Inc. announces that it has extended its business agreement with Steele Components & Ammo LLC, the Idaho based OEM reloading component distributor. The Army Corps of Engineers issued a small craft advisory for the Arkansas River. Recent rains in Oklahoma and Arkansas have caused flows to rise. MYSTERY RANCH is proud to announce their partnership with Conservation Visions and the newly developed Wild Harvest Initiative®. More farmers can reduce groundwater use thanks to a grant from the Walmart Foundation. The $1 million grant complements $6.5 million from the USDA Natural Resources Conservation Service (NRCS) to support on-farm work through the USA Rice-Ducks Unlimited Rice Stewardship Partnership. SHOT Show Industry Day at the Range concluded on Monday, January 21 with record breaking attendance of 1,815 media and buyers. Over 200 exhibiting manufacturers were involved in test firing, demoing and displaying the hottest new products on the market. Registration is open for the Full Moon 5K race at Patoka Lake beach, which will take place Friday, Aug. 16 at 9 p.m. In addition to its unrivaled nighttime operation, Stealth Cam's new G45NGMAX offers diverse setting customization to achieve the best imaging and video results regardless of the terrain or site layout. Before you head out the door to collect shed antlers, you must complete the Division of Wildlife Resources’ Antler Gathering Ethics course. You can take the free course at www.wildlife.utah.gov/shedantler. The hunting of male mountain lions in northwestern Montana hunting district 130, which includes portions of Lake and Missoula counties, will close at one-half hour after sunset on Friday, Feb. 8, 2019. Eric Juergens, Territory Sales Manager for Legacy Sports Int. Eric Juergens is one of the top Territory Sales Managers for Legacy Sports Int. Eric works primarily in the Midwest area, covering business with Distributors, Buy Group members and Independent Dealers in Iowa, Illinois, Missouri, Minnesota and Wisconsin. Celerant Technology announced a strategic partnership with Management One to offer retail solutions to enable both small and large retailers to forecast inventory, control budgets, optimize sales and maximize profits. Bill Hicks & Co., Ltd., a distributor of wholesale sporting goods, received the 2018 “Premium Partner” Award from Federal Ammunition. Davidson’s is currently seeking a passionate, shooting and hunting enthusiasts with outside sales and/or merchandising experience to serve as our Regional Customer Relationship Manager in the Pacific Northwest region (Washington, Montana, Oregon, Idaho, Wyoming, Nevada, and Northern California). Smith & Wesson Precision Components seeks a manufacturing quality engineer for the Deep River, CT location. Smith & Wesson Precision Components is seeking candidates for the operations manager position for the Deep River, CT location. This is a high level, high visibility position that requires excellent interpersonal, organizational, managerial and leadership skills. QuietKat, an advanced Low-Speed Electric Vehicle (LSEV) manufacturer with a distinct focus on Electric Mountain Bikes, is currently seeking a qualified sales professional with a customer service & sales background for a Sales Representative position located in our Eagle, Colorado office. A leading international Electro-Optics company is seeking a Vice President of Sales and Marketing, who will lead a US subsidiary based in Harrisburg, Pennsylvania. The Vice President of Sales and Marketing will take an active role in determining the vision and direction of the rapidly growing multi-channel U.S. sales network. Senate Bill 224, sponsored by Sen. Tom Jacobson, D-Great Falls, would increase the fine for an encroachment on a county road from the current $10 per day to up to $500 per day, with no minimum fine. Nomad Women's Harvester Jacket in Realtree EDGE Camo is the ideal mid-season jacket designed specifically for women who hunt. Michigan Department of Natural Resources trail officials are advising snowmobilers riding in the Upper Peninsula to use extra caution because of hazards produced by significant weather-related events. Houston Safari Club (HSC) is supportive of the nomination of David Bernhardt, Deputy Secretary of the U.S. Department of the Interior, for the position of Secretary for the Department. During the North American Versatile Hunting Dog Association’s recent 50th anniversary celebration, Pheasants Forever & Quail Forever signed a formal partnership agreement with NAVHDA. During a recent meeting, the Missouri State Chapter of the National Wild Turkey Federation approved $305,530 in funding to support Save the Habitat. Save the Hunt. initiative in the state. Scott Leysath, host of The Sporting Chef and Dead Meat on Sportsman Channel, joins Ken on this week’s show with tips for handling wild game from field to table. If you can catch it or kill it, Scott can make it delicious. This week on Bass Pro Shops Outdoor World Radio, host Rob Keck is at The 2019 SHOT Show in Las Vegas. Keck is joined by Tony Schoonen, Chief of Staff for the Boone and Crockett Club, sharing the details of their upcoming 30th Big Game Awards, as well as Karen Butler, President of "Shoot Like a Girl", a company dedicated to growing the number of women who participate in shooting sports by empowering them with confidence. It’s ways to help the community training and education efforts of the "Black Guns Matter" program, the refusal of the House Judiciary Committee to hear from Congressman Steve Scalise on current gun control legislation, training talk with Tiger McKee, an introduction to concealed handguns, and more, this week on Tom Gresham's Gun Talk Radio. Indiana Conservation Officer Jon Watkins, who serves Dubois County, has been selected the 2018 District 7 Officer of the Year. Kahr Arms is offering a $45 Consumer Rebate for all new Kahr pistols purchased from February 1 to May 31, 2019. Alabama’s sixteenth community archery park held its grand opening on Wednesday, February 6, 2019, at Walker County Public Fishing Lake near Jasper, Ala. The next meeting of the Arizona Game and Fish Commission will be at 8 a.m. Friday, Feb. 8 at the Holiday Inn in Yuma, Ariz.
First stop of the year is Henrietta TX for turkey fest. Then it’s off to Kansas to hunt Romo at Shallow Creek Outfitters. Mike finds out how versatile Mojo’s Scoot-N-Shoot is on fired up Gobblers. The Association of Fish & Wildlife Agencies supports the introduction of the Chronic Wasting Disease Transmission in Cervidae Study Act. It’s a sight you have to see to believe: thousands of snow and Ross’ geese lifting off Gunnison Bend Reservoir amid honks and the beating of wings. Today marks the 25th anniversary of the founding of Crimson Trace. According to the release, Crimson Trace began in the backroom of a machine shop in 1994 – the year I began writing for law enforcement publications. That was the time of the product that required guns to be sent to the factory for installation of the laser sight to the frame. The gun was the GLOCK pistol. As of my trip to the factory about four years ago, they were still seeing those ‘machined into the gun’ laser sights periodically come in for service. 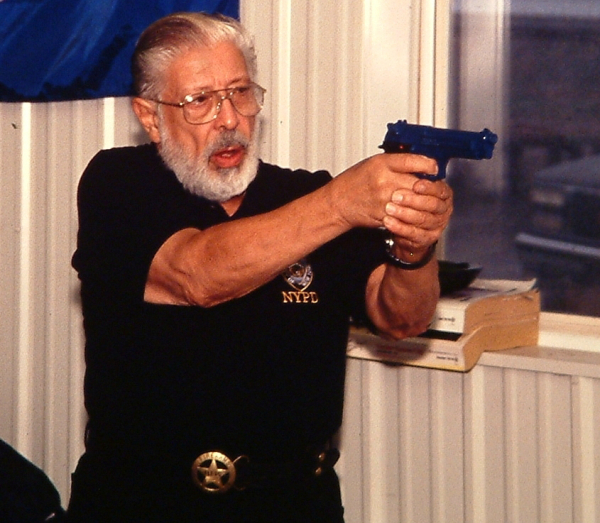 Since then, the Lasergrip came out – that’s when I came in, brought along by Jim Cirillo (NYPD, US Customs, ret’d) and Clyde Caceres (national class police trainer). They convinced me that the laser sight was practical – though, for me, the more practical use was on the small backup gun. Still, I’ve used them on service-size pistols. It was a time before the ‘accessory rail’ was common on pistols. The choices were to machine the frame for the emitter, power source and switching or just use ‘grips.’ There were no grips available for my agency’s selected sidearm and we didn’t issue GLOCK pistols. The Lasergrips went on the backup. 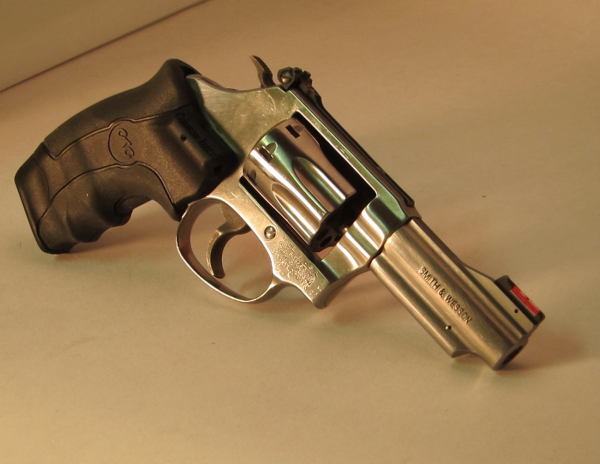 The S&W Model 442 (satin nickel) pictured has early Lasergrips on board. I still had a Ruger SP101 357 Magnum I’d worn as a backup earlier in the 1990s when Crimson Trace developed Lasergrips for that cannon. A set went on that revolver too. 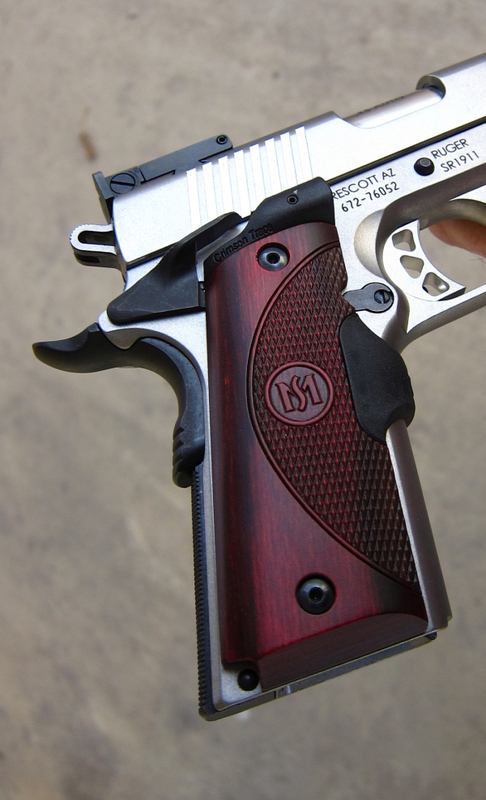 An early satin nickel S&W Model 442 with early Crimson Trace Lasergrips. 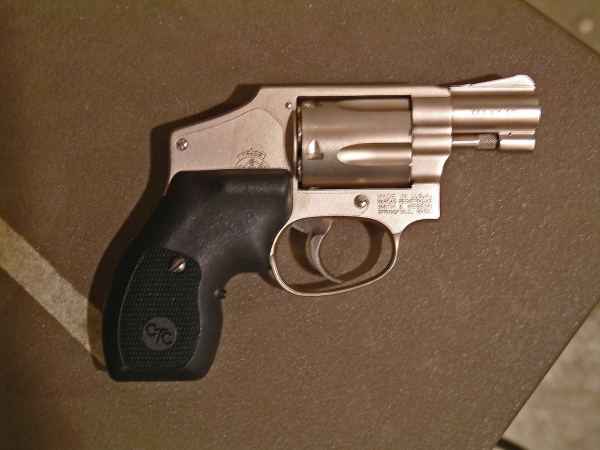 Below, the Ruger SP101 357 Mag. got the same CT treatment. Crimson Trace is fond of the term “Instinctive Activation” and it’s one time that term is properly used. Under stress, the human critter seems to clutch his hands into fists and that’s what activates the laser aiming diode on the Lasergrip. If you only have one hand to use the gun, you still get the dot. If you can’t raise the gun to eye level – due to injury or some other circumstance – you still get the dot. Control the trigger while maintaining a firm grip and the bullet goes where the dot is – if you took time to zero the Lasergrip. And that’s easy to do. I said I had a service size pistol I outfitted with Crimson Trace Lasergrips – it was a backstrap, actually, for the M&P40. Along with the Crimson Trace light on the dust cover, I had the potential for positive target ID in adverse light along with a laser aiming device. Gripping the gun turned on both laser and light. They’ve continued to make lasers for backup or small deep concealment guns too – I’ve used the Laserguard on guns like the Ruger LCP and the GLOCK 42. They still have backup guns covered. 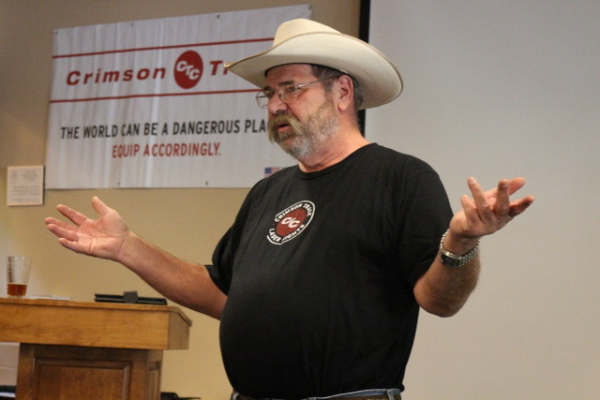 Gunfight survivor, master instructor and retired law enforcement officer, Jim Cirillo made use of Crimson Trace Lasers for training and for carry. 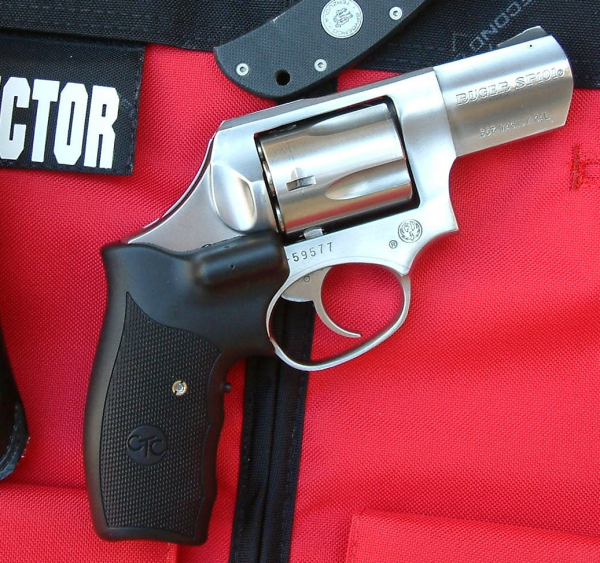 Below, the S&W Model 63 "Kit Gun" with a Lasergrip, is still being used as a training revolver. For training purposes, Crimson Trace Lasergrips shine – so to speak. It was Jim Cirillo who showed me the Ring’s Blue Gun training model fitted with Lasergrips that he used for in-class demos and to determine whether students were properly using the “iron sights” on the “pistol” by having the aimer adjusted below the student’s line of sight. To add to their training aspect, Crimson Trace, now the Electro-Optics Division of American Outdoor Brands Corporation, acquired LaserLyte. Known for “firearm training systems, laser sights and bore sights,” the LaserLyte product lines will mesh nicely with Crimson Trace product offerings. 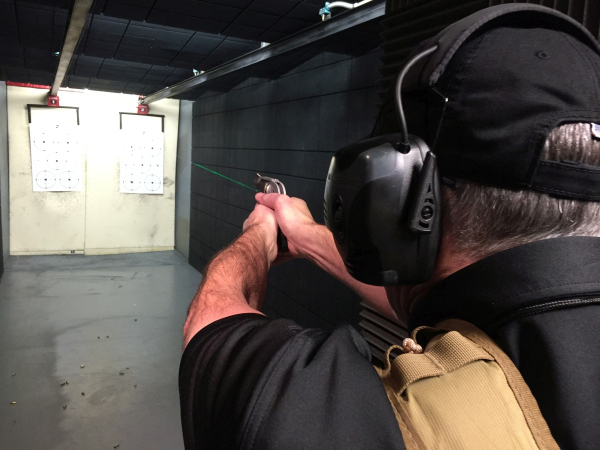 The Crimson Trace factory features an indoor range for testing products. Below, company founder Lew Danielson at a Midnight 3-Gun match, in a Jim Shepherd OWDN photo. The company clearly has not rested. I had occasion to lunch with founder Lew Danielson during Industry Day just a few weeks ago. He’s retired now and asked me what I thought about the company’s continuing development. I mentioned the move into red dot sights and magnified optics while maintaining a presence in the laser sight market with the new “Lasersaddle” for shotguns. Currently for the Mossberg 500, 590 and 590 Shockwave in 12 gauge, they have “activation points” on both sides of the device which fits over the top of the back of the receiver. Lew told me he’d kicked around a shotgun aimer a few years back and that he was very happy they’d completed the project. I’d heard “common taters” (h/t, Claude Werner) complain that Crimson Trace would only produce gear for guns under the brands of the new owner American Outdoor Brands after the acquisition of the company. That wasn’t a pattern I’d noticed with AOBC – and with the advent of the Lasersaddle as well as initiatives with other gun makers, my guess was confirmed. 25 years out, Crimson Trace is a force in the market. I have to confess that I’m not surprised.